Uncle Paul West seemed to know everyone in El Dorado, and many of his special acquaintances he introduced to me. He and Uncle Ed were brothers of my Mom and both were special favorite uncles. When Pop and Mom married in 1944 her brothers were serving on active duty in the US Army, and when they returned home in their uniforms as Private First Class with the ending of World War II, they were heroes to me. As an impressionable 6-year-old anyone in uniform automatically became a revered hero. Just to have the chance to talk with them would have been enough, but they loved telling about their experiences while serving overseas and fighting the Germans. Uncle Ed fought in the Battle of the Bulge, and when he would tell stories of bullets flying everywhere, grenades exploding and mortar shells coming in, I would sit with rapt attention. When they returned home both men had families to support, and there was not an abundance of job opportunities in El Dorado. Mom and her wealthy sister from St. Louis, Aunt Tooky (Thelma Manne), purchased a small grocery store on Jackson Street in order for the brothers to have steady jobs. Uncles Paul and Ed were personable and able salesmen, and the Quality Grocery was moderately successful with their work in the meat and produce sections. Aunt Tooky moved to El Dorado for several months to help Mom operate the business portion of the store, and because it was during the winter months that she was there, it was quite a sight to see Aunt Tooky wearing one of her mink coats to the store. It was a neighborhood store and not at all fancy, but Aunt Tooky added her own style and class to the ambience! Uncle Paul was by far the best in the family at sales, and the other jobs and positions he held in later years were enhanced by his ability to meet people and establish close relationships. He seemed to know people from all walks of life and could usually tell a funny story or tale about everyone he knew. It always fascinated me to hear him tell his stories, but I was never quite sure they were all true. One evening when I arrived home for supper after a particularly hard day the phone rang and it was Uncle Paul. I was pretty sure he had another referral when he said, “I have this good friend named Brother W.O. Miller who is a retired Baptist minister, and he needs some help. He is bleeding and had to go to the emergency room. Can you go out there and take care of him?” My initial impression was to let the ER doctor take care of him, but I would have disappointed Uncle Paul and made him look bad when he told Brother Miller he would call me to help him. I’m glad I did without supper that night and went to the ER to offer my services. Brother Miller needed an operation which I was able to do for him, and he recovered from a serious malignant condition. Brother Miller and I became good friends and spent lots of time talking about the Lord Jesus, and how He had changed both of our lives. He had such a passion for serving people, and he demonstrated it daily through his 50+ years in the ministry. His pastorates had been mostly small congregations who struggled financially. Consequently, Brother Miller and his wife had lived on a meager income and had no significant retirement funds apart from Social Security. The photograph above was taken on the official opening Sunday. Brother Miller is seated on the front row and to his right is his wife with a small child between them. On the end of the front row to Brother Miller’s left is our son John Aaron and to his right is Mom in her elegant fur coat which seemed a little out-of-place at the Mission. To her right is Aunt Helen, Uncle Paul’s wife. I am on the back row directly behind Brother Miller. Bubba is to my right and he was one of the speakers that morning. Uncle Paul is to Bubba’s right. Bubba’s wife, LaNell is seated in front of Uncle Paul. The Mission served God’s purposes in that area of town for a number of years. 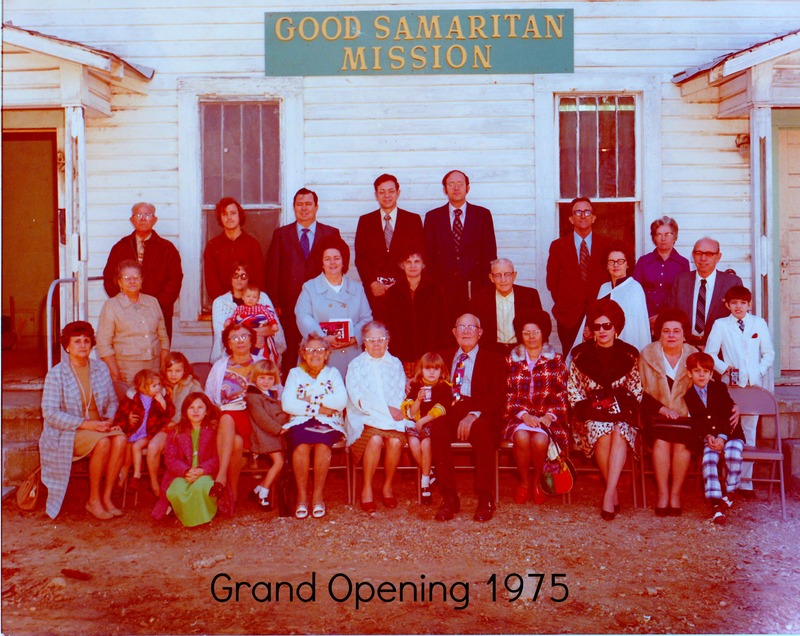 Most of the people in the photograph apart from Bubba, Mom, John Aaron and me were regular attenders of services at the Mission. We were active in our church and couldn’t attend most Sundays. On that particular Sunday Cathy, Mark Kay and Ginny were not present because of prior commitments at our church. Brother Miller invited Bubba and me to preach there as often as we were available, and those were some of my earliest experiences at preaching. In looking at my preaching notes from those days my preaching was pitiful but never lacked in personal enthusiasm. I would study for hours and based on my notes, the messages were deep on historical information and very shallow on practical information which would have been pertinent to the listeners at the Mission. Everyone present patiently endured my messages and most even complimented me on a “fine job.” I now understand the effectiveness of sound Biblical preaching is not related to how well the preacher does, but how effective the Word of God penetrates the hearts of the preacher and the hearers. Brother W.O. Miller completed his earthly service for the Lord at The Good Samaritan Mission, and his work there might have been his greatest. I do know he was faithful to the finish, and I am so thankful my Uncle Paul knew such a spiritual giant who served as an ordinary preacher. I’m equally glad Uncle Paul introduced me to him, because I am a much better man for knowing both of them. Oh yes, the Good Samaritan Mission! I remember going to hear your brother preach there a lot of times. I remember one older man who used to go door to door witnessing in the neighborhood with Berry Lee. Your brother once told me that as they walked together, he shared with his ministry partner that sometimes felt so much joy from knowing Jesus that he felt like dancing down the street. And as I recall, the old man ministering with Berry Lee agreed wholeheartedly and promptly proceeded to do just that! Let’s not forget to mention JA’s mighty fine blue and white plaid pants!!! Those are fancy!